The city of Sydney has been built around its beautiful harbour, yet much of it is protected with large swathes of green, multiple headlands and cozy sandy beaches. 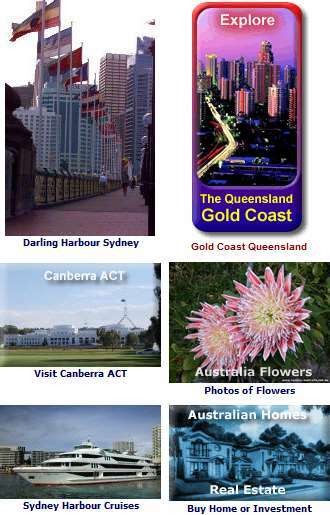 An enjoyable way to get to these places to visit such as historical Parramatta, the Olympic Site at Homebush, Manly Beach and others including Taronga Zoo is to take a ferry, jetcat or rivercat from Circular Quay. Although named Sydney Harbour by most Sydneysiders, the official name of Sydney Harbour is Port Jackson, which consists of Sydney Harbour, as well as Middle Harbour and North Harbour. It also extends to the Lane Cove River and to the end of Parramatta River, which extends this natural harbour some twenty kilometres westward. The total area of Port Jackson covers an area of fifty-five square kilometres of water, with the shoreline extending some two hundred and forty kilometres. The total volume of the water contained here is estimated to be over half a million megalitres. Broadcast around the world, the Sydney New Years Eve can be enjoyed in 3D surround sound on a New Years Cruise! Bookings are limited! Royal Botanic Gardens - Has more than 7500 trees and was established in 1836. Situated by the Sydney Opera House the gardens cover more than 30 hectares of colourful flowers, rose gardens, threatened and exotic species and splendid harbourside views. Taronga Zoo, easily accessible by ferry from Circular Quay, has a large collection of Australian fauna plus other animals from around the world. Including of course, Koalas, Wombats, Kangaroos, Wallabees and many more. Sydney Harbour Bridge can not only be photographed, but climbed, walked over and explored at the Bridge Museum. Entrance Cumberland Street, there are great harbour views to be had. A BridgeClimb Tour is the ultimate way to enjoy spectacular Sydney Harbour views. 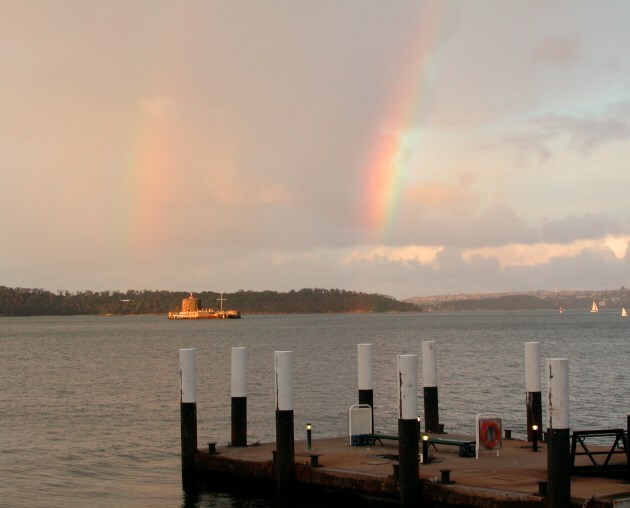 The Harbour Islands, including Fort Denison and Goat Island can be toured via the National Parks and Wildlife Service harbour cruises at Cadmans Cottage on Sydney Cove, The Rocks. The Sydney Opera House juts out into the Harbour on Bennelong Point. There is actually quite a lot to do and see there, including plays, orchestras, jazz, dance, cultural performing arts from around the world, tours and even shopping for performance memoribilia and souvenirs. Close up views Sydney Opera House Photos. You can get to historic Parramatta by Rivercat from Circular Quay. This route follows the Parramatta River from the west of the harbour, and you can also get to the Homebush Olympic Site, with its parks, attractions and sporting venues. The Rocks, on the west side of Sydney Cove at Circular Quay is Australia’s finest restored historical district, and combines a great collection of restaurants, historic pubs and places to shop. The body of water that separates the Sydney Opera House from the Rocks is Sydney Cove, where the First Fleet decided to settle. Manly Beach is another favourite place to visit on the harbour for both Sydneysiders and overseas visitors. Accessible from Circular Quay, ferries and Jetcats take you across 7 miles of spectacular harbour views. See more about Manly Beach - Sydney. Lunch cruises, dinner cruises and sightseeing cruises operate daily from Circular Quay. Getting to Circular Quay is easy, as it is a major train, bus, taxi and ferry terminus. See Rocks and Circular Quay Map. Photo: City on the Harbour Views.